About Us | GlycoBioSciences Inc. | GlycoBioSciences Inc.
About Us | GlycoBioSciences Inc.
GlycoBioSciences Inc. is a pharmaceutical company exclusively devoted to the sale, licensing and development of therapeutic products based on our Ionic Polymer Matrix (IPMTM) technology. 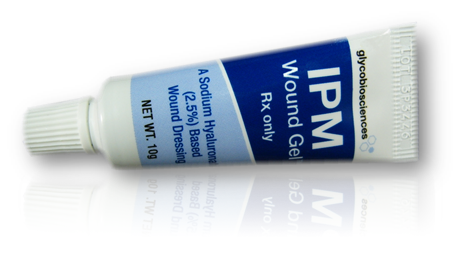 Our IPM Wound Gel Bio product is FDA cleared under 510 (k)s K123193 and K143527. Glyco has had new patents issued/granted covering its IPM Wound Gel Bio product and related technology, and other products that utilize Glyco's IPM Technology in the US (US patent 9,821,005) and in Australia and Mexico, and Glyco has patent applications pending in several other countries currently as well. In February 2019 Glyco's IPM Wound Gel Bio product was launched in the US by Glyco's US partner Gentex Pharma LLC, under the name Hygel Wound Gel, the initial response to the product has been exceptional, and Gentex has already ordered another commercial batch of the Hygel prdouct. Ionic Polymer Matrix is a patented trans-dermal delivery technology utilizing a combination of a non-ionic polymer with a highly negatively charged polymer (Hyaluronic Acid) of specific molecular weight in a stable and PH balanced gel. This gel is capable of encapsulating other molecules (drugs i.e. sodium diclofenac, vitamins i.e. niacin). Such blended gel(s) applied topically to skin can be used for trans-dermal delivery of encapsulated molecules to targeted areas and release into systemic circulatory system. Blood and urine tests performed by us confirm the delivery and presence of these molecules.